Getting something from nothing sounds like a good deal, so for years scientists have been trying to exploit the tiny amount of energy that arises when objects are brought very close together. It's a source of energy so obscure it was once derided as a fanciful source of "perpetual motion." Now, a research team including Princeton scientists has found a way to harness a mysterious force of repulsion, which is one aspect of that force. This energy, predicted seven decades ago by the Dutch scientist Hendrik Casimir, arises from quantum effects and can be seen experimentally by placing two opposing plates very close to each other in a vacuum. At close range, the plates repel each other, which could be useful to certain technologies. Until recently, however, harnessing this "Casimir force" to do anything useful seemed impossible. A new silicon chip built by researchers at Hong Kong University of Science and Technology and Princeton University is a step toward harnessing the Casimir force. Using a clever assembly of micron-sized shapes etched into the plates, the researchers demonstrated that the plates repel as they are brought close together. 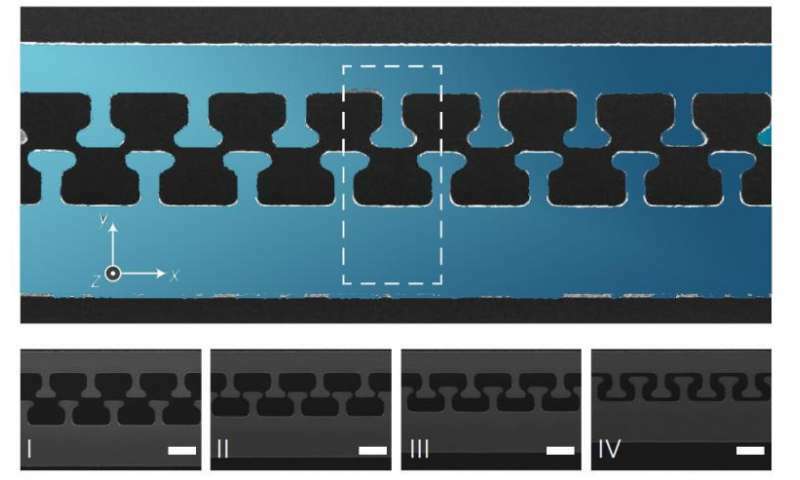 Constructing this device entirely out of a single silicon chip could open the way to using the Casimir force for practical applications such as keeping tiny machine parts from sticking to each other. The work was published in the February issue of the journal Nature Photonics. "This is among the first experimental verifications of the Casimir effect on a silicon chip," said Alejandro Rodriguez, an assistant professor of electrical engineering at Princeton University, who provided theoretical calculations for the device, which was built by a team led by Ho Bun Chan at Hong Kong University of Science and Technology. "And it also allows you to make measurements of forces in very nontrivial structures like these that cause repulsion. It is a double-whammy." This repulsive effect happens without any input of energy and to all appearances, in a vacuum. These characteristics led this energy to be called "zero-point energy." They also fueled earlier claims that the Casimir force could not exist because its existence would imply some sort of perpetual motion, which would be impossible according to the laws of physics. "Our paper shows that it is possible to control the Casimir force using structures of complex, tailor-made shapes," said Ho Bun Chan, senior author on the paper and a scientist at the Hong Kong University of Science and Technology. His team drew on earlier work by Rodriguez published in 2008 that proposed shapes that would be expected to yield a Casimir force that could both attract and repel. "This paper is the experimental realization using a structure inspired by Rodriguez's design," Chan said. "We tried to think about what kind of shapes Chan's group would have to fabricate to lead to a significant repulsive force, so we did some background studies and calculations to make sure they would see enough non-monotonicity as to be measurable," Rodriguez said. This repulsive effect happens without any input of energy and to all appearances, in a vacuum. These characteristics led this energy to be called "zero-point energy." Theres a little misconception i guess..
"At close range, the plates repel each other." "Experimental realization of these novel designs could open the possibility for . . . levitating nanomechanical devices." Energy free levitation could enable a working perpetual motion machine. If one end of an arm rotating around a pivot is always repelled upwards by the Casimir force, and the other end is pulled down by gravity, it will spin until the forces cease or it breaks. Impossible? "Levitation = floating above surface, not repelling upwards." Give me a break, levitation requires something to balance the attractive force of gravity. The authors speculated it would be achieved with a repulsive Casimir force. They also fueled earlier claims that the Casimir force could not exist because its existence would imply some sort of perpetual motion, which would be impossible according to the laws of physics. If it tuned out that on this tiny micro scale that a form of perpetual motion could be said to occur then that would not be against the laws of physics it would just be a modification of physics in the same way that an electron not spiralling into the nucleus was not against the laws of physics, it just required some new physics at that scale. The study authors did not produce a perpetual motion machine. The study authors did not suggest a method for producing a perpetual motion machine. You can get repulsion from a magnet, but you can't make a perpetual motion machine from one. I suspect the same is true for Casimir forces. It's not a source of energy, but a limit on the nature of molecular interactions between surfaces. Phys.org does us no favors by dragging perpetual motion into the discussion of this research. Of course not. They produced a zero point energy machine. This energy is limited by the size and scope of a finite universe. Otto wrote, "They produced a zero point energy machine." If you mean this in the sense that they have produced an energy source that can be harvested, no. They have not. Doesn't mean it's not useful. Everything in physics is useful, in that it permits us to do engineering in a partly-comprehensible universe. No i meant it in the sense of humor. The article decribes a process of 'harvesting'. IOW used to do work. All energy used to do work is transformed into another form of energy. 'Cannot be created or destroyed' yes? "sparked interest in applications of the Casimir effect toward the development of levitating devices. An experimental demonstration of the Casimir-based repulsion predicted by Lifshitz was recently carried out by Munday et al. Other scientists have also suggested the use of gain media to achieve a similar levitation effect..."
Otto, your definition of 'work' is odd. A magnet used to repel another magnet, holding it up against gravity, is not doing work. In layman's terms it's 'working,' performing a function, but the definition of 'work' for physicists, talking about energy, excludes it. This is a very similar effect. You have two surfaces repelling each other. There isn't a way to extract energy from this and use it to perform work, as physicists define work. You certainly could engineer stuff to take advantage of the Casimir effect, maybe obtain low-friction machines or something, but you can't turn it into a source of useful energy. There should be no terms like 'tapping zero point energy' or 'perpetual motion machine' attached to this research. "In physics, a force is said to do work if, when acting, there is a displacement of the point of application in the direction of the force. For example, when a ball is held above the ground and then dropped, the work done on the ball as it falls is equal to the weight of the ball (a force) multiplied by the distance to the ground (a displacement). Work transfers energy from one place to another or one form to another." -Since you werent aware of the term in the context of physics I wonder what else you dont know? which indicates that the force due to a magnetic field is always perpendicular to the motion of a charge. "However, this does not preclude a magnetic field from doing work under the right circumstances. If you put a magnetic dipole in a non-uniform magnetic field, it will feel a net force in the direction of the gradient of the field. It will be accelerated in that direction, and the field does work on it." -Etc. Take some time, read a little. If you look at the Figure 1 then the configuration that is shown as II is where repulsion happens (and you can easily work this out by seeing that the knobs are actually attracting where they are close to one another - but it makes the entire structure go further away from each other due to the geometry). Pretty clever. Auntie, your conception of 'work' is also odd. In your example, the magnetic field isn't a source of energy. It can have potential energy (like a battery), which is then drained while doing work, whereupon it stops doing work, unless an actual energy source is applied. If this wasn't true, we could use magnetic fields to generate electricity with no input from external energy sources - perpetual motion machines with excess energy to bleed away for other uses. The notion of 'tapping vacuum fluctuations' ('zero point energy') is a concept requiring us to presume that energy from vacuum fluctuations can be endlessly harnessed to do work. It's an hypothesized, very large, energy source. While it's interesting to see attraction converted cleverly to repulsion by manipulating surfaces in close proximity to each other, that is *not* an energy source, let alone a path towards tapping vacuum fluctuations for almost limitless energy to do work. Otto wrote, ""However, this does not preclude a magnetic field from doing work under the right circumstances. If you put a magnetic dipole in a non-uniform magnetic field, it will feel a net force in the direction of the gradient of the field. It will be accelerated in that direction, and the field does work on it." Again I didnt write that, its from a reputable source. Do you have any reputable sources for the stuff you make up? Not a single one of you understand the quantum foam. Its nothing like an electromagnetic process. In electrodynamics, only a moving magnetic field does work. This means that it responds to a field drain by slowing down, and that means energy has to be injected to speed it back up. We know of various ways of doing this and they all require energy input. Their energy output is always of a more entropic and less usable type than their input. Work is a force over a distance. Work translates types of energy into one another. How true! Because, y'know, nobody does. Science's ability to probe physics below the quark scale is practically nonexistent. Between quark and Planck scales are 20 orders of magnitude. All we got is theory, baby. Understanding is a long way off. Of course the amusing apart is, wkingmilw is posturing as though *he* understands the quantum foam while everyone else doesn't. That's crankish, to say the least. Otto wrote, "Again I didnt write that, its from a reputable source." Yepper. The problem isn't with your source, Otto. The problem is with your lack of comprehension of what your source is saying.